I am Russ Joseph, the UIC for CAPO Girls Softball. I want to help everyone learn about the game that we play every Saturday. I will post 1 to 2 case plays each week and try to focus on real plays that happened during the past few weeks. I will place the newest entries at the top of the list. I also will answer questions if you send them to me at josephrt1@yahoo.com. I hope this is helpful to all members of the Capo community. All feedback is welcome. A ground ball is hit past the 1st baseman. The 2nd baseman, playing deep is able to field the ball and attempts to run to 1st base and beat the runner. The speedy runner, reached the orange base before the fielder and as she crossed the base, the fielder in possession of the ball, stepped in front of the runner. A violent collision resulted, the runners helmet hit the fielder in the head and both players went down. The fielder held onto the ball. This is a “no-call” but the play was killed immediately. The runner is safe because she beat the fielder to the bag. The play was killed immediately because of the violent collision and possible head injury. (see Rule Supplement -Injured Player). The fielder was in possession of the ball and collided with the runner. This is not considered a crash but is rather incidental contact. The fielder stepped into the runners path at the last instant and the runner could not avoid the collision. This is different than a runner crashing into a fielder who is in possession of the ball and already in their path. Rule Supplement 13, Crashing, F & G, explain this. When the ball, runner and defensive player arrive at the same time and contact is made, the umpire shall not invoke the crash rule, interference or obstruction. This is merely incidental contact and the ball remains live. A runner advanced safely from 1st to 2nd on an infield ground ball; all runners safe. The ball is thrown to 2nd base. As the fielder walks towards the pitcher, the base runner at 2nd starts walking off the base towards 1st base. The fielder seeing this, steps on the 2nd base bag before the runner returns. The runner is OUT because this is a force out. Even though the runner had already attained 2nd base, when she stepped off towards first base the force situation is reinstated. She is forced to go to 2nd; she cannot go to 1st because 1st base is occupied. Rule Supplement 1, Appeals, J. Force Out , "The force is reinstated when the forced runner retreats towards the base first occupied". With runner on 2nd, the batter gets a hit to the outfield. This results in a play at the plate and the runner is safe. The batter sees the throw to the plate and heads to 2nd. The throw comes to the 2nd baseman about 6 ft towards 1st base. The fielder reaches for and catches the ball which drew her into the runner’s path resulting in a collision. With runner on 2nd, the batter gets a hit to the outfield. This results in a play at the plate and the runner is safe. The batter sees the throw to the plate and heads to 2nd. The throw comes to the 2nd baseman about 6 ft towards 1st base. She receives the ball and then is standing in the runner’s path. The runner is tagged out, but claims she was obstructed. With a runner on 2nd base and no outs, the batter hits a line drive just over the baseline between 2nd and 3rd base. The shortstop who was playing shallow runs back to attempt to catch the ball. As she crosses the baseline, the runner and fielder collide. With runner on 2nd, the batter gets a hit to the outfield. This results in a play at the plate and the runner is safe. The batter sees the throw to the plate and heads to 2nd. The throw comes to the 2nd baseman who is standing in the runner’s path without the ball. Before the ball arrives, the runner bowls over the fielder and the ball goes into the outfield. In “a” we have a “no-call” and the ball remains live. Rule Supplement 13, Crashing, F & G, explain this. When the ball, runner and defensive player arrive at the same time and contact is made, the umpire shall not invoke the crash rule, interference or obstruction. This is merely incidental contact and the ball remains live. Note: this is for a thrown ball and not a batted ball. In “b” we have an OUT. The fielder is allowed to stand in the runner’s path when the fielder is in possession of the ball. This is not obstruction. Obstruction is the act of a defensive team member, who impedes the runner…unless the fielder is in possession of the ball. Definitions. The runner must avoid a crash and if she runs outside the 3 foot lane, she should be called out. Rule Supplement 13, Crashing, E.
In “c” we must make a call, but it depends on what really happened. The runner must give the fielder the right of way to field a batted ball, only if the fielder has a chance to make the out. If the ball is too far over the fielder’s head and the umpire determines it was not a catchable ball, we have obstruction by the fielder. A delayed dead ball is signaled and verbalized by the umpire and play is allowed to continue. If the umpire determines the ball was catchable, we have interference by the runner, the play should be called dead immediately, and the runner called out. This is covered in Rule 8, section 7.J. which states, The runner is out when the runner interferes with a fielder attempting to field a batted fair ball. In “d” we have obstruction. The fielder cannot be in the path of the runner without possessing the ball. But it is NOT ok to intentionally harm another player, even if that player should not be in the way. Light or normal contact is obstruction on the defender and results in a delayed dead ball signal. Anything more aggressive can be treated as unsportsmanlike conduct by the runner and dealt with by a warning or ejection. With no outs and 2 runners on at 1st and 3rd, the pitcher steps on the rubber, brings her hands together, separates her hands, brings them back together and goes into her pitch. The umpire signals illegal pitch. The pitch comes into the batter and hits her foot. With 2 outs and a 2-2 count on the batter, and 2 runners on at 1st and 3rd, the pitcher steps on the rubber, brings her hands together, separates her hands, brings them back together and goes into her pitch. The umpire signals illegal pitch. The pitch comes into the batter and she hits a ground ball to 3rd. The third baseman holds the runner at 3rd and throws too late to 1st. The runner remained at 3rd and all runners are safe. In “a”, we have an immediate dead ball when the ball contacts the batter. The batter is awarded 1st base and all runners are awarded 1 base (Rule 6 Section 3N Effect 3.). In this case no choice is given, per rule. In “b” the batter reached 1st base, but not all runners advanced 1 base. Therefore, per Rule 6 Section 3N Effect 2 the coach will be given a choice of the result of the play or a ball on the batter and advance the runners. This becomes a strategy decision for the coach. Does he take the results of the play which loads the bases with 2 outs or does he take a ball on the batter and advance his runners which results in a run scored. Coach’s choice. The batter swings late and makes contact with the ball on an outside pitch. The ball skips off the ground in foul territory and about 30 feet from home plate the ball spins back into fair territory where it is fielded by the pitcher who throws to 1st, ahead of the runner. With runners on 1st and 2nd and 1 out, the batter pops up halfway to 1st base. The ball hits the ground, untouched, in foul territory, but spins back into fair territory where it is fielded by the 1st baseman who holds the ball. With runners on 1st and 2nd and 1 out, the batter pops up halfway to 1st base. The ball hits the ground in fair territory, but spins and comes to rest, untouched, in foul territory. In “a” and “b” the batter is out. In “c” this is a foul ball, a strike on the batter and runners return to their bases. But “b” and “c” are also possible Infield Fly situations. We’ll come back to the infield fly in a minute. Case a and b are fair balls. Even if a ball starts out foul, it is a fair ball if it comes into fair territory. Rule 1: Definitions – Fair Ball-C defines a fair ball as “”While on or over fair territory, touches the person, attached equipment or clothing of a player or an umpire. Both case “a” and “b” meet this condition. Case “c” is covered by Rule 1: Definitions – Fair Ball-A which states A Fair Ball is “A legally batted ball that settles on or over fair territory between home and 1st base or between home and 3rd base.” Case “c” settled in foul territory and is therefore a foul ball. Cases “b” and “c” also are potentially Infield Fly situations. But an Infield Fly can only be called on a fair ball. Since case “b” ends as a fair ball and we had an Infield Fly situation, we have a fair ball and the batter is out. In case “c”, the ball was foul which negates the Infield Fly and we simply have a foul ball and a strike on the batter. With 1 out and a runner on 2nd base, the ball is hit towards the shortstop. The runner runs in front of the shortstop and is hit by the batted ball before the fielder could get to it. With 1 out and a runner on 2nd base, the ball is hit towards the shortstop. The 3rd baseman goes for the ball but it goes by her untouched. The runner, running between the 3rd baseman and the shortstop is hit by the ball. With 1 out and a runner on 2nd base, the ball is hit towards the shortstop. The 3rd baseman goes for the ball but it goes by her untouched. It also gets by the shortstop. The runner, running behind both defenders is hit by the ball. With 1 out and a runner on 2nd base, the ball is hit towards the shortstop. The 3rd baseman goes for the ball and deflects it, but does not handle it cleanly. The runner, running between the 3rd baseman and the shortstop is hit by the ball. In “a” and “b” the runner is OUT. In “c” the runner is not out and we have a live ball (no call is made). In “d” the runner is not out and we have a live ball, unless the runner intentionally interfered with the ball. Rule 8, Section 7J.1. states, The runner is out ..when a runner interferes with a fielder attempting to field a batted fair ball. This rule applies to case “a”. Rule 8, Section 7K. also applies since the ball had not passed a fielder other than the pitcher. Rule 8, Section 7K. applies to cases “b” and “c”. This rule states, The runner is out ..When a runner is struck by a fair untouched batted ball while not in contact with a base and before it passes another infielder excluding the pitcher, or if it passes an infielder and another infielder has an opportunity to make an out. In “b” the runner is out because the shortstop still had an opportunity to make an out. In “c”, the ball remains live and the runner is not out because the ball was by both infielders and there was no other infielder who had an opportunity to make an out. Note: the fielder must have an opportunity to make an OUT, not just a play. Case “d” is covered by Rule Supplement 33, A, 1b., Interference. This section states…It is interference if the batted ball deflects off 1 defensive player and the runner intentionally interferes with any defensive player who has an opportunity to make an out. “Intentionally” is an umpire judgment call and unless the interference is blatant, a deflected ball that hits the runner will usually be left as a Live Ball (no call is made). With 2 out and the bases loaded, a ground ball is hit to the shortstop. The runner on 3rd broke towards home on contact and crossed the plate just before the shortstop’s throw was caught at 3rd base for the force out at 3rd. With 2 out and the bases loaded, a ground ball is hit to the shortstop. The runner going from 2nd to 3rd delays to allow the runner to score. Then the runner from 2nd is tagged out. With 2 outs and runners on 2nd and 3rd, a ground ball is hit to the third baseman. The runner from 3rd crosses the plate before the runner from 2nd is tagged out for the final out. With 1 out and runners on 2nd and 3rd, a fly ball is hit to left field. Both runners tag-up, but the runner on 2nd leaves 2nd and heads to 3rd before the ball is touched and caught by the left fielder. The runner from 3rd tags correctly and crosses home plate. Before the next pitch, the shortstop appeals that the runner on 2nd left early. The umpire upholds the appeal and calls the runner from 2nd out, ending the inning. In a and b, the run does not count. When the inning ends on a force out, runs scored on the play do not count. Rule 5 Section 5 B 1. states, “No run shall score if the 3rd out of the inning is the result of A batter runner being called out prior to reaching first base or any other runner forced out due to the batter becoming a batter-runner.” Rule Supplement 21 Force Out states “A force out can be made by tagging a runner who is forced to advance to a base or by touching the base to which they are being forced.” In “b”, the runner was tagged out, but she was forced to advance to 3rd by the batted ball. Therefore, since she was tagged out before reaching the next base, this is also considered a “force out”. In c and d, the run counts. In both plays the runner crossed the plate before the 3rd out was made and the 3rd out was not a force out. In “c” the runner on 2nd was not forced to advance. Therefore the run counts. Play “d” is an appeal for leaving too early. At the time that the out was made by the defense on appeal, the runner had already crossed the plate. Therefore the run counts. Many people mistakenly consider leaving too early a “force” play”. It is not. Rule Supplement 1 K, Appeals-Tag-up states ”When a runner leaves a base too soon on a caught fly ball, this is considered a time play and not a force out. All runs scored in advance of the appealed runner and prior to the legal appeal count.” At the time the out was made, the runner had crossed home plate and the run counts. Note: there are some appeal plays that are “force outs”, such as an appeal for missing first base. If that were the 3rd out of the inning, this force play would cancel any runs that scored on the play. A batter hits the ball to shortstop. The shortstop fields the ball and throws to the 1st baseman but the ball sails over the 1st baseman’s head and into the dugout. Where do you place the batter-runner? Why? A batter hits the ball to second base. The 2nd baseman boots the ball and chases after it. The fielder retrieves the ball just as the batter-runner crosses 1st base. The 2nd baseman throws to the 1st baseman but the ball bounces away from the 1st baseman and rolls into the dugout. Runners are on 1st and 2nd. The runner on 1st base takes a large lead on the pitch. The catcher throws to first but the ball skips off the 1st baseman’s mitt and rolls out of bounds. Where do you place the runners? Why? In “a” the batter-runner is awarded 2nd base. In “b” the batter-runner is awarded 3rd base. In “c” the runner on 2nd is awarded home and the runner on 1st is awarded 3rd base. In all cases this is a 2-base award. Rule 8, Section 5G states “Runners are entitled to advance without liability to be put out …When the ball is live and is overthrown [thrown out of bounds] or blocked”. All runners shall be awarded 2 bases. The award is based on the position of the runner when the ball left the fielder’s hand. The rule is clear that the award is always 2 bases. The key is knowing the position of the runner when the ball left the fielder’s hand inorder to correctly place the runners. In “a”, the runner was positioned between home and 1st base. Therefore the 2-base award gives the batter-runner 1st base and 2nd base and places the runner on 2nd base. In “b” the runner had already reached 1st base before the ball left the fielder’s hand. Therefore a 2-base award will advance the runner to 3rd base. In “c” the runners were on 1st and 2nd base when the pick-off attempt started. Therefore this runners will be awarded 2 bases which will place the runner on 1st base on 3rd base and the runner on 2nd base will be awarded home. It does not matter when the ball goes out of play or where the runner is at the time the ball went out of play. It does not matter if the catcher or the center fielder threw the ball. It only matters where the runner was at the instant the ball left the thrower’s hand. Then add 2 bases from each runner’s position and we are done. Note: Even if you are awarded 3rd base, you must touch 2nd base on the way or the opponent may appeal missing a base. Two closely related situations that result in only 1-base awards are a pitched ball (Rule 8 Section 5C) or a loss of possession (Rule 8 Section 5G1) that go out of bounds. Any pitched ball that goes out of bounds is a 1-base award. A pitch is a pitch and is not considered a throw. If a fielder loses possession of a ball that then travels out-of-bounds (for example, a swipe tag results in the ball rolling free and out of bounds), this is also a 1 base award. With 1 out and runners on 1st and 2nd, the batter pops up the ball to the 3rd baseman who hardly moves and catches the ball. With the infield pulled in, 0 outs and the bases loaded, a low pop-up is hit over the second baseman’s head. The second baseman runs back and catches the ball over her shoulder while lunging for the ball. The umpire should declare "Infield Fly the Batter is Out" by calling it loudly and holding his/her arm high signaling the out. This is done when the ball is at the top of the arch. An infield fly cannot be called for a line drive or for a bunted ball. These are live balls that must be played out. When the ball is popped-up near the foul line and the umpire is not sure if this will be a fair or foul ball, the umpire calls, “Infield fly if fair”. If the ball remains fair, whether caught or dropped, the batter is out. If the ball is foul, it is not an infield fly. The batter is out if the foul ball is caught. If the ball is not caught and remains foul, the runners return to their bases and a strike is assigned to the batter. To call an infield fly, the umpire must judge that the ball can be caught with ordinary effort. In the second example, this should not be ruled an infield fly. It took much more than ordinary effort to run back and catch the ball hit over the 2nd baseman. A player is caught in a run-down (pickle) between 3rd and home. As the runner is heading home, the ball is thrown to the catcher who bobbles the ball and the ball rolls free. The runner takes about 5 steps toward 1st base and runs around the catcher and then heads back to home and touches home plate. First there are 2 definitions you should know. The base line is defined as a straight line between bases. It can be imaginary (between 2nd and 3rd) or a physical line drawn on the field (between 3rd and home). In the play described above, the base line is irrelevant. The base path is defined as "a line directly between a base and the runner’s position at the time a defensive player is attempting to tag that runner". The runner is SAFE. In this case, the defensive player did not have possession of the ball and therefore the runner is not obligated to adhere to a base path. When a defender is not making an attempt to tag the runner, the runner can go in almost any path from one base to another without penalty. 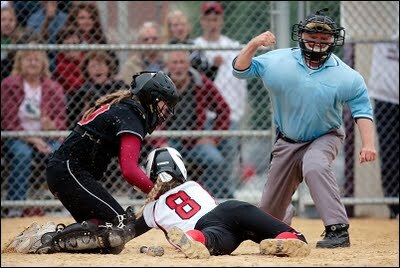 If the catcher had caught the ball and maintained possession, the runner would have been obligated to stay within 3 feet from the imaginary line defined by her position and the next base. Rule 8, Section 7A states: The runner is out when running to any base in regular or reverse order and the runner runs more than three feet from the base path to avoid being touched by the ball in the hand or the glove of a fielder. Since the fielder had dropped the ball, she could not attempt to tag the runner. A similar situation can result when a runner leaves the base line to avoid interfering with a fielder attempting to field a ball. The runner is allowed to do this. Once the fielder has possession of the ball and is attempting to tag the runner, a base path is now established and the runner cannot run “more than three feet from the base path to avoid being touched by the ball in the hand or the glove of a fielder”. This is covered in Rule 8, Section 8A which states: Runner is not out ...When a runner runs behind or in front of the fielder and outside the base path in order to avoid interfering with a fielder attempting to field a batted ball. The batter swings and misses while a runner is stealing 3rd base. The catcher comes up throwing and her hand hits the batter who is out of the batter’s box and attempting to get out of the catcher’s way. This is a case of batter’s interference and the batter is OUT. Rule 7, Section 6P states: The batter is out when hindering the catcher from catching or throwing the ball by stepping out of the batter’s box. (No intent to interfere is required.) Rules 7-6Q and 7-6R cover similar events. In the case above, since the batter was out of the batter’s box and hindered the catcher who was making a play, the batter is called out and runners are returned to the last base touched before the interference occurred. The safest thing for a batter to do when a runner is attempting to steal a base (other than home) is to finish her swing and stand like a statue in the box. Then it becomes the catcher’s obligation to avoid the batter. There are other types of batter interference such as with a play at the plate. For a play at the plate the batter must get out of the way and not interfere with the catcher throwing or flipping the ball or attempting to tag the runner. This is Rule 7 Section 6S. In both cases the batter is out and the runners return to the last base touched before the interference. There can also be additional penalties if the interference was intentional to avoid a double play. Also, in unusual circumstances, the runner could have already advanced a base before the interference occurred. In this case the runner remains at that base and is not returned to the original base.